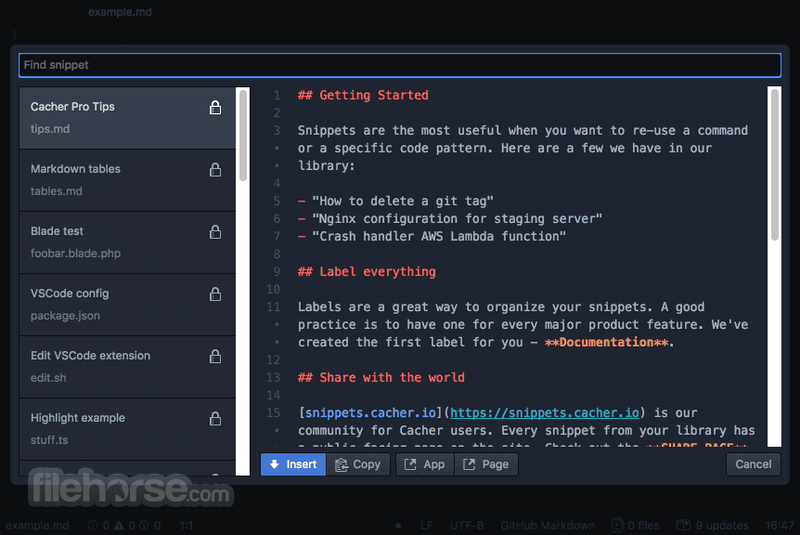 Cacher is the best place to store your code snippets, whether you are an individual or a member of a team. Long term memory for coders and their teams! Build a cloud-based snippet library for you and your team. Team snippets are the best way to distribute project knowledge, share tips and onboard new members. Awesome code snippet app for PC! Itfeatures editor and syntax highlighting support for over 100+ programming languages, from Python to Go to VMEL. Use Cacher’s flexible color-coded labeling system to organize your code any way you like. 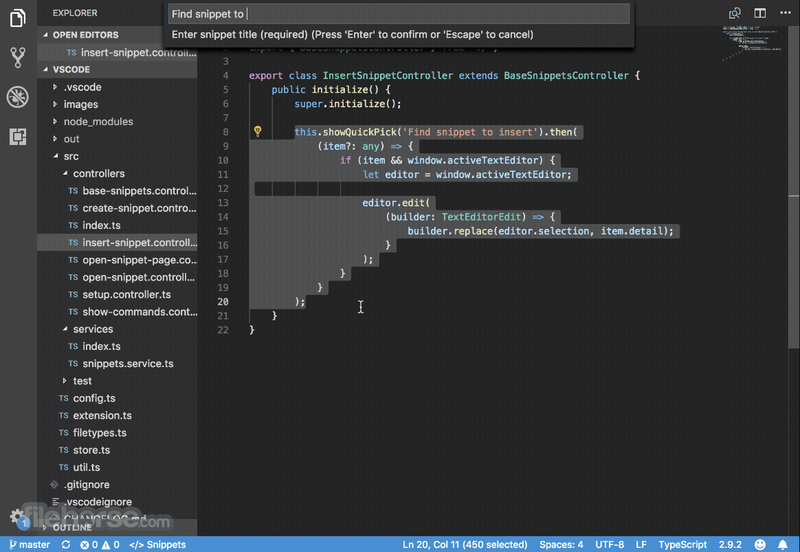 Install plugins for Visual Studio Code, Atom Editor and Sublime Text to create and insert snippets without leaving your favorite editor. 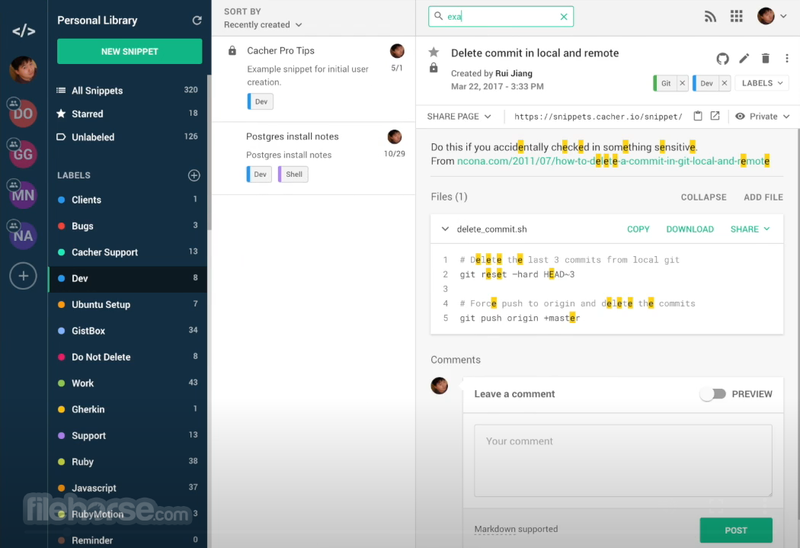 Every snippet has a page on Snippets, code-sharing community for users. Send snippet URLs through email, Slack, Twitter or embed them on your blog. Share code snippets across all platforms. Desktop apps for macOS, Windows and Linux. Use Cacher for Windows to create a beautiful knowledge base with support for Markdown files. Sign in with your GitHub account to have your snippets sync with Gist on every update. The best way to impart knowledge is by sharing code snippets. Great for sharing a new trick or for helping a new team member get up to speed. Use team libraries and labels to organize project knowledge. Every member views and contributes to the same set of snippets. Cacher for Slack gives chat participants the ability to save messages as snippets and stay on top of team activity. Use web browser extension to quickly save code examples from any webpage. Works great on StackOverflow and Medium. Fire up the Cacher Run Server to run code using your local machine's shell. Use it to quickly test algorithms or learn a new language. Tray App makes composing snippets a delightful experience. Use it to convert clipboard content and system files into snippets. Snippets can be tagged with one or more color-coded labels — a way to categorize snippets by project or purpose. Each Cacher user starts with a personal library, a collection of snippets and labels. Users can join teams and collaborate with teammates on snippets in a shared library. All your snippets are stored online and accessible via desktop clients for , and . When away from your machine, use the web app to access your snippets from any web browser. 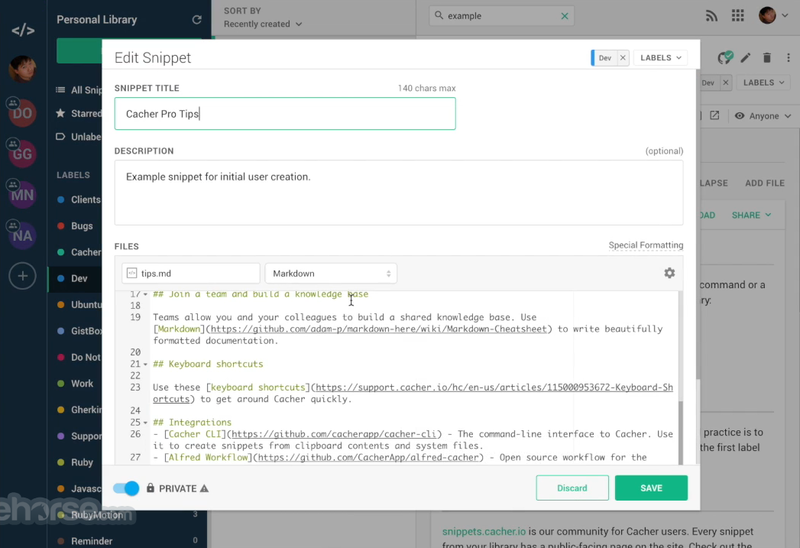 Share your snippets with colleagues with links to snippets.cacher.io. Import and sync your existing GitHub Gists. 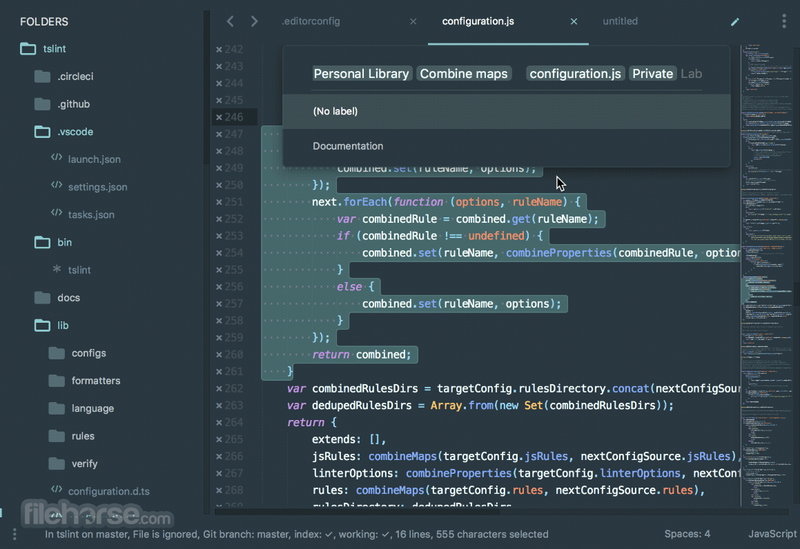 It offers extensions for Visual Studio Code, Atom Editor and Sublime Text. Create and insert snippets without leaving the comfort of your development environment. Alfred workflow and command-line-interface offer even more ways to access and create snippets. Use your snippet’s raw content to build elaborate bash scripts.